We all have those shirts that are just a little too short to be worn comfortably--you know the ones. Every time you wear them you are constantly tugging them down. Being a little taller than the average woman, I have had a lot of shirts like this throughout my life. Some of these shirts I have really liked, too, but they usually hang unworn in my closet (and then end up getting turned into baby clothes). This technique solves that problem! I came across this idea on Pinterest, which is great, except for a couple of problems. One: they are mixing a quilting fabric (read: woven, non-stretchy fabric) with a knit fabric (read: stretchy fabric). That is a big no-no in the world of sewing. Your shirt won't lay correctly or wear comfortably, and would be a pain to get on and off if it's at all fitted. Two: This technique just looked so added on to me. In my opinion, it needed something else--some kind of detailing to make it look like an intentional part of the shirt instead of an afterthought. I will probably be ordering some soon so I can lengthen more shirts! To lengthen your shirt, you will need a buckle and about 1/2 yard of knit fabric that coordinates with the shirt you are lengthening (or you can use another shirt, if you have one that would coordinate and is maybe stained or otherwise unwearable). Try on your shirt and mark it just below the bust line. I just used a pin, but if you are worried about poking yourself, use a safety pin. You can just barely see my pin in the picture. Lower your pin about 1/2" to account for the seam allowance. Measure the distance from your pin to the bottom of the shirt. Mine measured about 9 inches. Carefully line up the hem of the front and back of the shirt. Measuring up from the hem, mark the shirt all the way across at your measurement (9 inches for me). You can draw a line with tailor's chalk or an air-dry fabric marker, mark it with pins--whatever works for you. I placed my shirt on top of my cutting mat with a 1" grid, lined up the hem, and then followed the cutting line 9 inches up. Take a deep breath and cut your shirt at your mark. Cut through the front and back, all the way across. Now release your breath and breathe for a minute. It will be okay. Lay the bottom part of your shirt on top of your coordinating knit fabric. Make sure your fabric is laying the correct way. You want the stretchiest part to go across the shirt. Cut a piece of fabric that is about 1/2" wider than the shirt on each side--1" wider, total. Move the shirt out of the way and cut your fabric into a long, skinny rectangle. The part you just measured and cut is going to be the length of the rectangle. To figure out the width of the rectangle, decide how much length you want to add to your shirt. I recommend 3-4 inches. Add an extra inch for seam allowance. I wanted to add 4" to my shirt, so I cut my rectangle to a width of 5". Using this rectangle as a pattern, cut 3 more, for a total of 4 rectangles. Pin two of the rectangles together along the long edges, right sides together. Sew the long edges together using a 1/2" seam allowance. Turn right-side out, so that you have a tube. Get out your buckle. It's going to look way too narrow for the rectangle, but don't worry about that. Slide the sewn rectangle through the buckle. I think it looks so cute gathered up around the buckle like that. Lay out one of your other rectangles, right side up. Lay the buckled rectangle on top of it, also right side up. Please note that you are not putting the right sides together as you usually do when sewing. Line up the ends and pin together, centering the sewn rectangle on the other one. You should have an extra 1/2" of the underneath rectangle hanging off at the top and bottom of the belt. Sew the rectangle and the belt together at the side seams. You will now be treating this as one piece. With right sides together, place the remaining rectangle on top of the belted piece. Sew them together at the sides seams. Now you are going to find the center front and center back of the new midsection you have created. To do this, line up the side seams together and fold it in half. Mark the center front and back with a pin. Repeat the process to find center front and back of the top of the shirt. Matching side seams, center front, and center back, pin the midsection to the top part of the shirt. 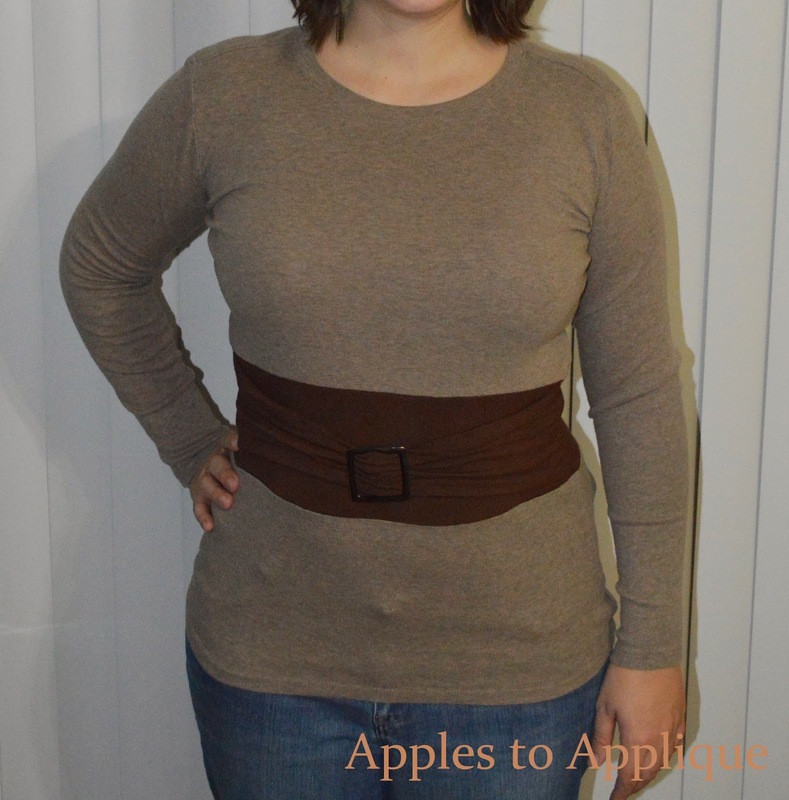 Be careful to make sure the front of the midsection is matched with the front of the shirt. The belt flops around a lot at this point, so it can get mixed up easily if you're not careful. Sew or serge the top of the shirt to the midsection. Be careful not to catch the edge of the belt in the seam. In fact, you may want to pin it back out of the way. Find the center front and back of the bottom section of the shirt. Pin it to the midsection, matching side seams, center front, and center back. Sew or serge the midsection to the bottom section of the shirt, again being careful not to catch the edge of the belt in the seam. You have successfully lengthened your shirt and added a bit of detail! The seams look a little wonky here for a couple of reasons: one, they haven't been pressed yet, and two, my midsection was made out of a super soft and stretchy fabric. A good pressing can work wonders, and when the shirt is on, it lays fine. I hope this helps you get more life out of your wardrobe! Yes, this is a great way to dress up a plain shirt or change the waistline! It really is fast and easy.